Martin Paul Roche | Where Is The Life? 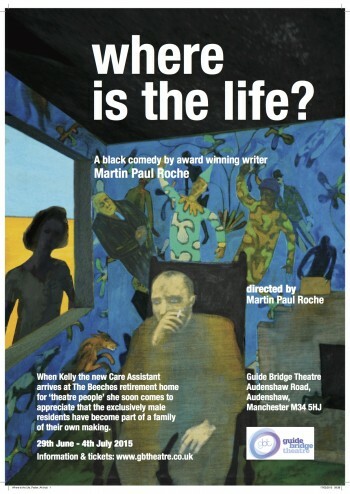 Martin Paul Roche - Where Is The Life? "I am all booked! I'm even more excited than when I first saw it because now I know how fabulous it is!" The Beeches is a residential home for retired gentlemen of the stage. It is run by Julie, the officious owner who is married to Tony, a letch who is nice but a little dim. Tom, Colin, Alan and Don are residents who have spent their lives in theatre and equally, working together. Despite their ups and downs they have created their own family in The Beeches to replace the families they no longer seem to be a part of. They have come from a bygone world and have now created a new world in The Beeches which is bound together by images, reflections, memories, longings of the past but equally, yearnings for a future. Tom is a camp old hoofer who could not be more affected. Alan is a neurotic and frustrated gay man who will not speak of his sexuality. Don is everybody’s granddad, warm caring and gentle. Colin is, well, Colin. He is angry, acerbic, cutting and sarcastic. He is the old queen of this castle and resents everything and everybody for reasons that even he no longer understands. His time is spent finding new prey and when Kelly the new care assistant arrives, he focuses in on her straight away with resentment, anger and jealousy and all because she has the things he can no longer have: youth ... and time. Despite the challenges created by them, Kelly soon comes to appreciate that the men have become part of a family of their own making and moreover, she finds in them a family she has never really known. And in doing so she sheds light into their forgotten world – a world where relatives are just a word and true family is four old men whose lives are inextricably bound together and in time, a young girl who realises that some jobs have the facility to teach you more than you think. She may have years of her life left, but she gives them a priceless gift... by helping them come to terms with the life in their remaining years. If you would like to learn more about this piece or details of how to gain permission to perform it, download perusal copies of the script or purchase a copy, please contact the publisher, Stagescripts. NB: the video shown is of a walkthrough of the set from the premiere production to give a flavour of the suggested staging. ... fantastic, hilarious comedy ... stellar show. reviewing Where is The Life?